Will Carbon Offsetting Go Mainstream at South by Southwest? This story first appeared on Ecosystem Marketplace, and was co-written with Kelley Hamrick and Allie Goldstein. The 29th annual South by Southwest Music Festival (SXSW) kicked off in Austin, Texas on Friday, and hundreds of thousands of concertgoers are flocking to the city. Most are coming by plane, bus, and automobile - emitting greenhouse gases in the process. If they're coming to speak on panel discussions, they'll have their emissions neutralized by festival organizers, who are purchasing carbon offsets on their behalf from Green Mountain Energy Company. But eco-minded fans have been on their own - until now. "We feel like the time is right to come at people with this solution," says Marisa de Belloy, Chief Operating Officer at a nonprofit called Cool Effect, one of a small but growing number of initiatives aimed at identifying top-tier offsets and then marketing them to individuals and small businesses. "Research shows that people feel alone, and don't feel like they can talk to anyone about these issues." 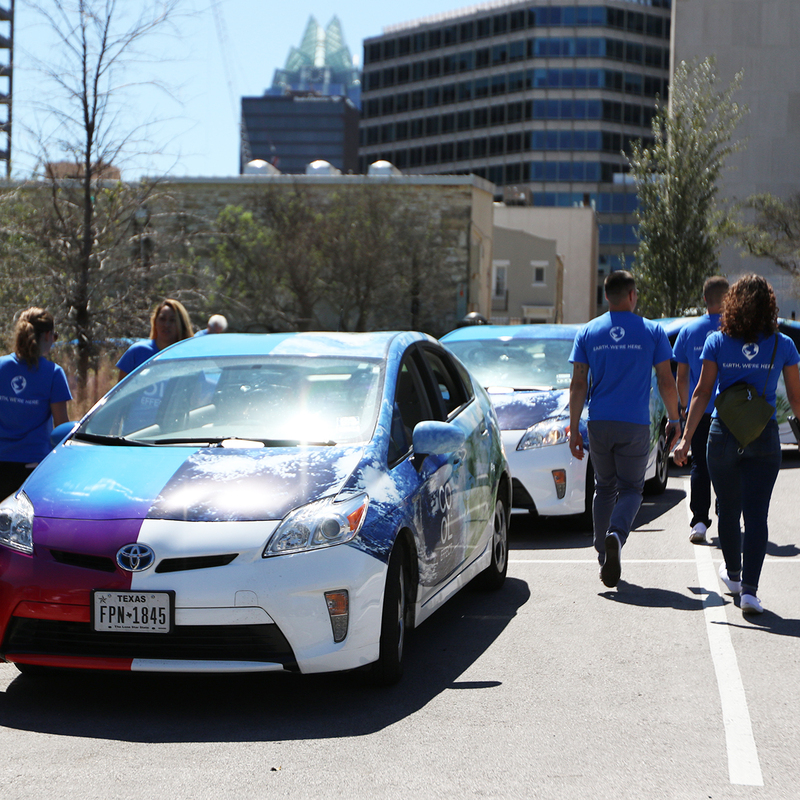 Cool Effect hired a fleet of Priuses and a team of young "brand ambassadors" to shuttle concertgoers around Austin and engage them in discussions carbon offsetting. The shirts say, "Earth, We're Here." Cool Effect launched its platform last week explicitly to target the SXSW crowd, and it comes almost a year after a similar initiative called Stand for Trees facilitated the sale of 20,000 offsets in just four days at $10 each, largely by teaming up with spoken word artist Prince Ea on Earth Day 2015. The two organizations aren't the first to make offsets available to individuals and small businesses - in fact, that option has always existed - but they are among the first to explicitly target these long-neglected demographics, and to do so with marketing finesse instead of just numbers and science. Both are reaching thousands of people, but volumes are minuscule compared to those generated by corporate buyers like General Motors, Barclays, Natura Cosméticos, and Marks & Spencer - and that's OK, says Peter Mach, Assistant Director of Stand for Trees, citing a recent deal with small but high-end Bedell Guitars, which last month started using offsets that reduce greenhouse-gas emissions by saving forests to, well, save forests rather than to offset greenhouse-gas emissions. "It's not a huge revenue-maker for us, but it's a good awareness-builder," says Mach. "That's actually more important, and it's bringing the concept to a whole new audience." Cool Effect is aiming for that same audience in Austin, and they're luring attendees with a time-honored crowd-pleaser: an event with free booze. While the actual purchasing platform is online, the new initiative aims to connect users with information about the projects they're supporting. "If you buy tonnes from a website you get a notification you bought the tonnes - and that's it," Dee Lawrence, co-founder of Cool Effect. "We're trying to make it really friendly and really accessible so we can engage people." 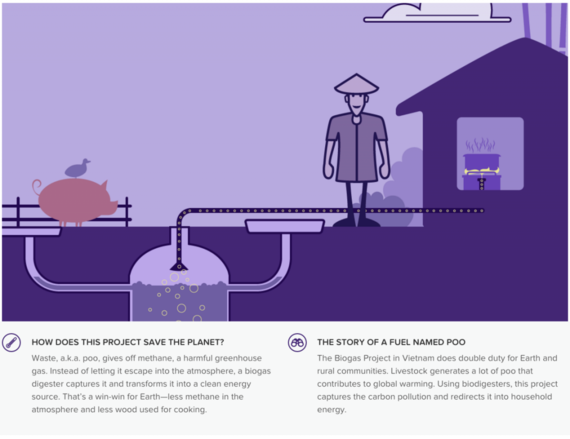 A screenshot from the Cool Effect platform describing a biogas project in Vietnam. 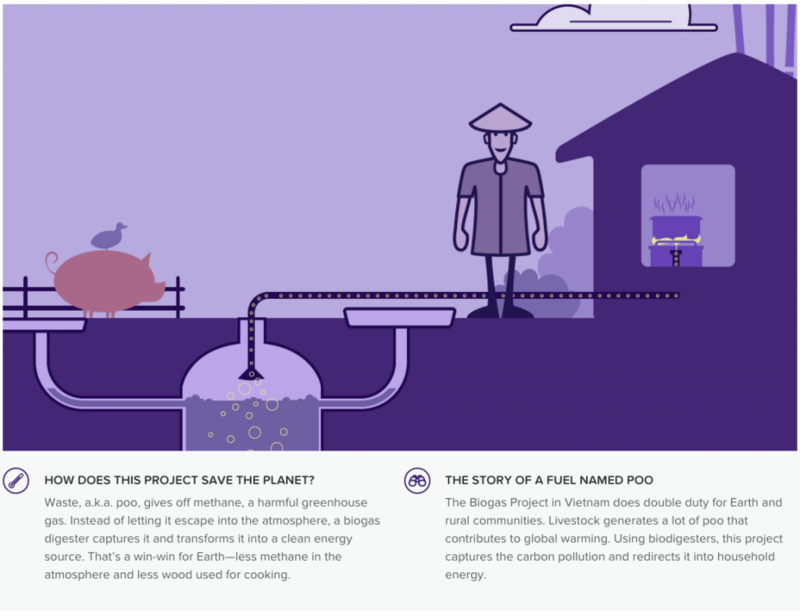 It uses a bit of humor to tell "the story of a fuel named poo." This meant working with a professional advertising agency and public relations firm Swirl over the last year to test different messaging - sometimes making the small startup of six feel like a team of 40 as they worked to make the website mobile- and graphics-friendly. The Cool Effect website currently features six projects chosen from across different project types and each project page provides a plain-English overview of the carbon sequestration activity along with a video and a list of the benefits and challenges of the projects. Each project has a number of available offsets that Cool Effect has already contracted and hopes to sell, with a live-time update of tonnes bought. Since its soft launch in December 2015 in Paris (and another push when SXSW started), individuals have purchased 3,370 tonnes through the platform. High-quality carbon offset projects go through a rigorous - and expensive - process of verification and validation, and project developers have traditionally looked to recoup their costs by going for high-volume corporate buyers. Ecosystem Marketplace's State of the Voluntary Carbon Markets 2015 report shows that Events/Entertainment is the 7th most popular sector for offset buyers, with high-profile events such as the Olympics, the World Cup, and the Superbowl falling into this category. But that same report shows an industry in stagnation: just 5% of reported transactions were from new buyers, and sales to individuals made up less than 1% of total transactions. What's more, brokers and corporate buyers tend to drive hard bargains. "Individuals, however, will pay top dollar to offset their emissions," says Karin Burns, Executive Director of Code REDD, which is a partner in Stand for Trees. "Of course, that's only if they trust the source." Initiatives such as Cool Effect and Stand for Trees have aimed to build that trust by providing accessible information about offset projects and allowing individuals to choose accordingly. Both include social media plugins so that users can easily spread the word. And both initiatives are highly transparent about pricing and fees. Stand for Trees sells offsets for $10 per tonne, with Code REDD taking a 7.5% commission and the credit card company taking an additional 5%. Cool Effect's pricing ranges by project, from $4.12 to $13.18 per tonne, and the initiative takes a 9.87% commission, including credit card fees. Through communications-focused platforms, the initiatives are spreading awareness of how carbon offsetting works, says Mach, adding that's what caught the attention of Sami Mulhern, director of Marketing & Artist Relations at Bedell Guitars. "She'd found us on Facebook and noticed we had a project called 'Brazilian Rosewood Amazon Conservation', which supports sustainable agroforestry in the Brazilian state of Pará," he says. "I initially though she was asking about offsetting their unavoidable carbon emissions from their factories, but she said they wanted to give back to the communities and bring funds back to the region." As of February, Bedell is buying 10 offsets from that project for every Brazilian Rosewood guitar it sells - essentially saving 5 tons of tree for each 10-pound guitar* - and for reasons that would probably strike a corporate accountant as too hippie dippy. "The acoustic guitar is a gift from Mother Nature," says company boss Tom Bedell. "It comes from the trees that grow in the forests all around the world, and the connection between our music and the Earth is part of our business." One year in, Mach says buyer demographics are becoming clear. "Among businesses, we've got everyone from sun-glass manufactures and makers of stand-up paddleboards to someone who makes dolls," he says. "Among individuals, they're typically millennials, especially women under 30." And, like Bedell, many aren't offsetting their emissions so much as proactively investing in nature, and the future. "While businesses tend to be offsetting emissions, a lot of individuals are more interested in conservation," he says. "We've also got a lot of high-school students and individual environmental groups that are starting at schools, and they're even branding themselves as 'Stand for Trees' groups, which is pretty cool." Buying Carbon Credits is Easier than Ever! * Remember your high-school biology: trees are made of roughly 50% carbon, which they get from the air by inhaling carbon dioxide, extract the carbon, and exhaling the carbon. For every 3.67 tons of carbon dioxide, the tree extracts 1 ton of carbon and exhales 2.67 tons of oxygen. Bedell buys 10 offsets for each rosewood guitar they sell, and that's 10 tons of carbon dioxide, which you divide by 3.67 to get 2.72 tons of carbon. Because trees are 50% carbon, you multiply that by two to get the total biomass. As usual, Joe Romm at ClimateProgress has one of the clearest explainers out there.